Organic Parboiled Brown Rice, Organic Dehydrated Black Beans, Organic Spices (Paprika, Black Pepper, White Pepper, Cumin, Celery Seed, Cayenne), Sea Salt, Organic Dehydrated Vegetables (Tomato, Red Bell Pepper), Organic Dehydrated Onion, Organic Dehydrated Garlic, Organic Sugar, Organic Rice Concentrate. Enjoy this popular combination inspired by the Cuban version of rice and beans. 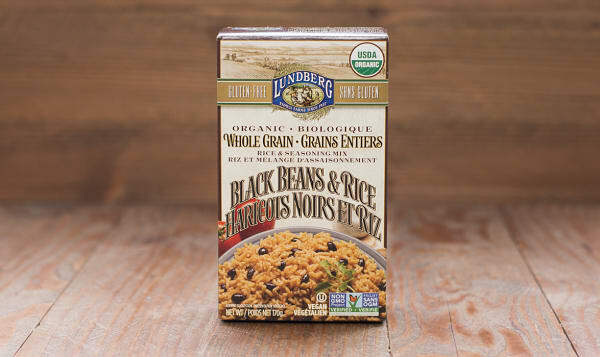 Made with whole grain organic brown rice and high-fiber black beans, it’s a deliciously smart way to serve up a healthful side dish. You'll love the spicy blend and the amazing flavor. This product traveled 1235 km to reach our warehouse. The Lundbergs have been growing rice ecologically since 1937, when Albert Lundeberg began farming in the Sacramento Valley in Northern California. Albert had lived through the Dustbowl and had seen, first hand, the long-term effects of poor soil management. Witnessing the ramifications of short-sighted farming techniques led Albert to believe that, on his farm, he should only employ methods that respect the soil, wildlife, air and water. In turn, he passed these methods on to his four sons who have continued to experiment and seek out new and innovative ways to farm ecologically. The Lundberg Family Farm works in partnership with nature to produce the highest quality rice possible. Unlike conventional rice farms, the Lundberg Family Farm never burns their rice fields after harvest. The straw is converted back into soil and they plant different types of crops to improve the soil fertility and tilth. These crops grow over the winter and enrich the soil with nitrogen. On conventional farms, the rice straw is burned, often with harmful chemicals, as it can cause diseases such as stem rot or it can "sour" the field. The Lundbergs chop the straw and roll it into the field with huge rubber rollers. The elements, along with the help of various waterfowl (ducks, geese, cranes) help to decompose the straw. Every few years the fields are left fallow to let the soil to replenish itself. The organic brown rice on the Lundberg's farm is also allowed to mature longer than conventional rice. This gives the rice a fuller, more complete flavour. Conventional white rice can be harvested earlier as younger rice is wetter, which means it is less likely to break or crack during milling.